barbie in Video Game Hero. barbie in her world, and barbie in the video game world.. Wallpaper and background images in the filmes de barbie club tagged: photo barbie video game hero. This filmes de barbie photo might contain retrato, headshot, close up, and closeup. 3 imagens of Blair from the Trailer = Full Blair! Barbie is so beautiful in this movie! But it would be better to change her eyes in the second photo, it looks like anime. Both girls in this picture are Barbie. 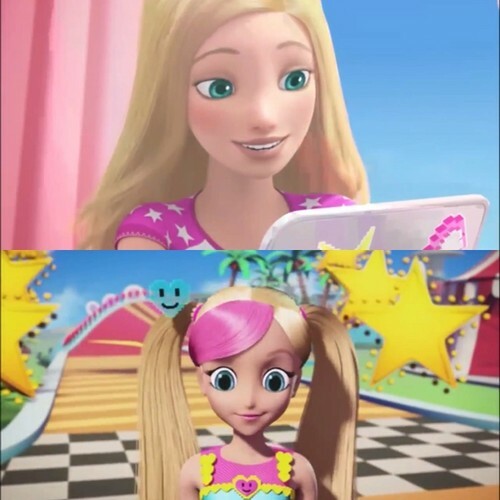 The top picture is Barbie in her world, and the bottom picture is Barbie in the video game world. ^My gosh, I though it's Chelsea. The bottom picture looks like a kindergarten/elementary school girl. Ahh...seriously I don't like the character design. @sparklefairy375 you like frozen, frozen character designs are even worse there are not even anatomically correct.How many times did you complain about that. @Activistbm: Eh, is that wrong? I just find the face of this Barbie doesn't really good, and it's just my taste. And why do you talking about Frozen? I do prefer the character design of Frozen characters more for honestly. Sorry if my words made you offended. I kinda wish the studio changes that Barbie's face mold they've been using.... its kinda weird.